Reluctant Chauffeur: Vegetarianism: Eating people, dogs, and at least lets be genuine, shall we? 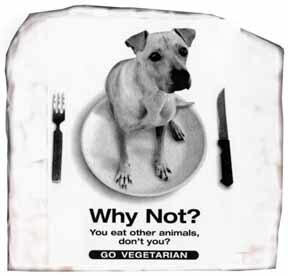 Vegetarianism: Eating people, dogs, and at least lets be genuine, shall we? Most carnivores are disgusted by the idea of eating dogs or people, so its ironic that as a vegetarian imagining life as a meat-eater, I have very little issue with it. Many responsible carnivores justify their diet by pointing out that farm animals have a much better life on a farm than they would in the wild because, despite being killed for food, they live longer and are free from the fear of predators and many diseases. I can understand that. I think eating meat is unnecessary, but I respect people who buy local meat and make sure the animals they're eating are treated well. Because animals don't speak English and perhaps don't have the ability to compare complex options, we can't ask them if they'd rather live and die on a farm or be in the wild, but I can imagine some humans might even choose a shorter life of comfort if presented with the same options. If a human agrees to live on a farm and be eaten, would it really be wrong to eat them? Would it be more, or less, wrong than eating a non-human animal against their will? Certainly it would be more moral than the torture and drugging many animals currently go through? To be clear, I don't think anyone should be eating any animals, humans included. It's entirely unnecessary for survival, it's generally unhealthy and in so many ways. But, if it came down to my survival I'd eat meat again, and that includes all kinds. I'd at least be genuine about it. If you're a carnivore and willing to try an empathy exercise, image search, "eating dogs" on Google. If you feel disgusted and appalled, understand that this is how many vegetarians feel about other animals you eat. With more and more studies showing how smart animals are, they are more justified in their perspective. Last week I shared a great article called One of Us that summarizes this beautifully.